When the news of the ever strenghtening Hurrican Florence was heard, Caruthersville Resident Jimmy Southern contacted his mother in Dillon County, South Carolina to put a plan in action to help with the problems the community would be dealing with in the aftermath of the storm. The idea of a "Stuff the Bus" was formed. 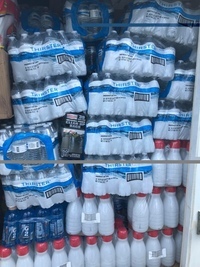 Southern joined with the Eastwood Memorial United Methodist Church as they invited area resident to come out and fill up a trailer with supplies that would be delivered to Dillon. Residents brought in bottled water, cleaning supplies, trash bags, pet food and much more until a larger trailer was needed. We would like to thank everyone who helped us "Stuff the Bus". Jerry Mattson, Ray Smith, Ben Baker, Charles Davis, Denny and Terri Callen all helped organize this event which gained an overwhelming amont of support. the Shipyard, Webfer Marine, Lady Luck Casino and a host of others made very generous donations. Thanks to Mayor Sue Grantham and City Administrators for helping make this happen Terry rushing sent four guys from his crew over immediately to help transfer the load. The donations went to help the people in this vicinity who were victims of Hurricane Florence. While in South Carolina, Southern saw the damage and visited with the FEMA headquarters and said the food donations were espeially goof for the Helping Hands Facilitis.